Archaeologists in India have found a group of skeletons from one of the world’s most ancient civilisations, in a discovery which could provide clues to the origins of the first human settlements. Four human skeletons, believed to be 5,000 years old, have been found in a cemetery at Rakhigarhi village in Hisar, a large Indus Valley (also known as Harappan) site. 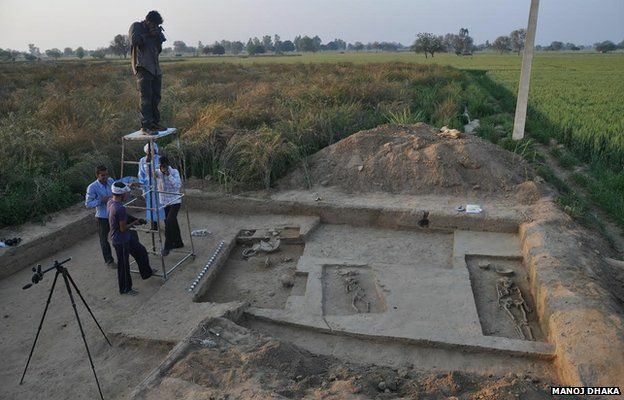 Archaeologists and scientists from India and South Korea have been carrying out excavations at the cemetery at Rakhigarhi village since 2013. These skeletons are of two men, one woman and a child. The height of the skeletons of the men is five feet and six inches and both were aged about 50 years while the height of the skeleton of the woman is five feet and four inches and was aged around 30 years. The child’s age was believed to be around 10 years. Enthused at the recovery of well-preserved skeletons, archaeologists hope forensic scientists will reconstruct the DNA extracted from bones to help decipher the history and origin of the human settlement, which is part of the Indus Valley civilisation. Using a novel software developed in South Korea, archaeologists are confident of projecting, in a few months, how the Harappans looked like 4,500 years ago — their build, the colour of their skin or hair, their facial features and so on. Besides pottery with grains of food, bangles, toys, mini wheels and sling balls of different sizes have also been recovered from the excavation site. The archaeologists have also found certain things that reveal that the settlers believed in reincarnation. Besides, the toys include mini wheels, miniature lids and sling balls of different sizes. The stuff is mostly made up of terracotta. The jewellery and the stamps found during the excavation give the impression that the settlers used to go out for their trade and also used to get some of their jewellery from outside the state. Archaeologists also recovered a seal which has some tiger-like figure inscribed on it. They believe that it was used in trade or for some other purposes. Tools which could have been used for fishing and hunting purposes have also been recovered. The excavation work was spread over an area of 50 acres and the archaeologists are still working on three mounds numbering 4, 6 and 7. According to archaeologists, the excavations at the different mounds have different significance. The excavation at mound number 4 will help them to figure out how and when did the Harappans settled here while the mound 6 reveals how were they living. Likewise, the mound number 7 has been established as the burial place, the archaeologist said. The Indus Valley Civilisation is one of the three oldest urban civilisations, along with Egypt and Mesopotamia. Ancient India during the Harappan era had one of the largest populations in the ancient world, far greater than the Middle East or Europe.